Practice the questions given in the worksheet on area and perimeter of triangle. Students can recall the topic and practice the questions to get more ideas on how to find the area of triangle and also the perimeter of triangle. 4. Find the area of a triangle whose sides are 24 cm, 32 cm and 40 cm. 5. The three sides of a triangle are in the ratio 2 : 3 : 4 and the perimeter 225 m. Find its area. 6. Find the area of a triangle, sides of which are 10 cm and 9 cm and the perimeter 36 cm. 7. The sides of a triangle are in the ratio 14 : 18 : 26, and its perimeter is 580 cm. Find the area. Also, find the altitude corresponding to the smallest side. 8. Find the height of a triangle whose base is 50 cm and whose area is 500 cm². 9. Find the base of a triangle whose altitude is 20 cm and area is 0.8 m². 10. Find the area of an equilateral triangle, the length of whose sides is 12 cm. 11. Find the area of an isosceles right angled triangle of equal sides 15 cm each. 12. The base and height of a triangle are in the ratio 8 : 5 and its area is 320 m². Find the height and base of the triangle. 13. Find the area of a right angled triangle whose hypotenuse is 13 cm and one of its sides containing the right angle is 12 cm. Find the length of the other side. 14. The area of a right triangle is 184 cm² and one of its legs is 16 cm long. Find the length of other leg. 15. The length of one of the diagonals of a field in the form of a quadrilateral is 46 m. The perpendicular distance of the other two vertices from the diagonal are 13 m and 10 m, find the area of the field. 16. The area of the triangle is equal to that of square whose each side measures 30 cm. Find the side of the triangle whose corresponding altitude is 36 cm. 17. 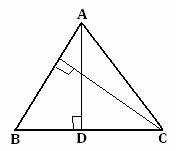 ∆ABC is isosceles with AB = AC = 6 cm, BC = 8 cm. The height AD from A to BC is 7 cm. Find the area of ∆ABC. What will be the height from C on AB? Answers for worksheet on area and perimeter of triangle are given below to check the exact answers of the above questions. 17. 9¹/₃ m, A = 28 cm.